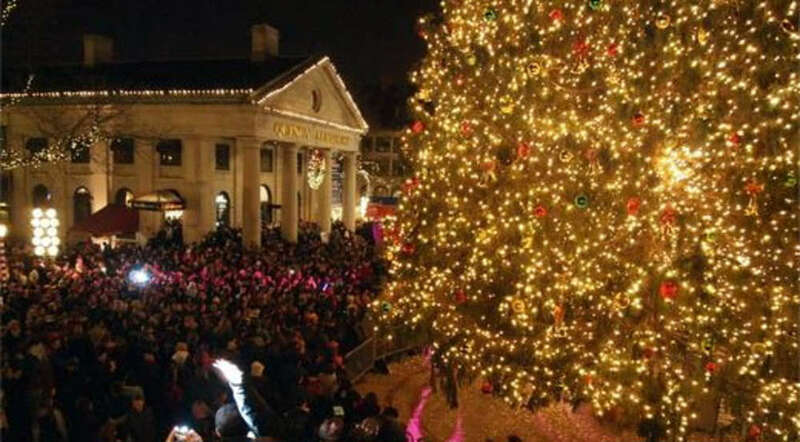 From tree lightings and holiday markets, to outdoor ice-skating rinks and annual performances, there’s no place like the Hub for the holidays. Find festive cheer around every corner and great deals for Boston’s vibrant performing arts scene. Whether you’re a train, plane, or just a quick car ride away, Boston’s magical merriment is worth the trip. Heck, hop the T and come in for a few hours to catch a performance of The Nutcracker or Holiday Pops, or the scintillating lightshow Blink! at Faneuil Hall Marketplace. Why not? Come explore the Hub this holiday season! Boston is steeped in history, but for every cherished tradition a new experience awaits and 2016 is no exception. Take the 50 foot White Spruce on Boston Common. This is tradition. The Tree for Boston is a gift from Nova Scotia commemorating Boston’s outpouring of aid for Halifax following a devastating fire in 1917. Next year will mark the centennial of the Halifax tragedy, and for the past 45 years Nova Scotia has sent a tree to Boston as a gesture of thanks and good will. 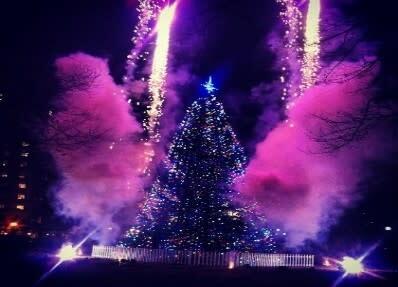 This year’s annual tree lighting celebration occurs on December 1. The very next day, down the road at City Hall Plaza, a new tradition is born as a European-style holiday market sets up shop alongside an 11,000 square foot ice skating rink. Check out the Grand Opening of this “Boston Winter” skating path and holiday exposition on December 2. This is Boston in a chestnut shell, tradition endures while new experiences await. Ice-skating rinks, holiday trees and markets do not exist in isolation here, they pop up across the city. City Hall Plaza offers the most recent installation of outdoor skating, but traditionalists may prefer a twirl out on the Boston Common Frog Pond or perhaps in Kendall Square or on the hilltop rink at Larz Anderson Park in Brookline. As for holiday lights, trees are lit in Copley Square and Harvard Square, at Macy’s, and on the State House lawn, while the beautiful trellis at Christopher Columbus Park sparkles in blue and the iconic Commonwealth Avenue Mall shines in serene white. For holiday markets, check out vendors in the South End, South Boston, Copley Square and Harvard Square. The Cultural Survival Bazaar, a festival of indigenous arts and crafts, comes to the Prudential Center December 16-18. The holiday season in Boston is distinguished by its unparalleled production of performing arts and artistic expression. Be sure to check out the Mayor’s Holiday Special for discounted tickets and dining deals. We mentioned The Nutcracker and boy does Boston have an eclectic lineup of performances. The classic choreography of Mikko Nissinen, an essential of the Boston holiday season, will be on stage at the Boston Opera House through December 31. Moscow Ballet’s Great Russian Nutcracker comes to Boston on December 4 with two performances at the Orpheum Theater; watch as Tchaikovsky’s countrymen dance to his timeless score. For a uniquely Boston version of this holiday favorite, check out Tony Williams’ Urban Nutcracker at Hancock Hall between December 16-31. Williams, the first African-American principal dancer at Boston Ballet, created Urban Nutcracker 16 years ago to infuse the performance with Boston’s diverse culture. Celebrating cultural diversity is a hallmark of the holiday season. In Boston, A Christmas Celtic Sojourn with WGBH’s Brian O’Donovan has enthralled audiences for 14 years, drawing on Celtic, Pagan and Christian traditions to compose a multifarious songbook performed at the Cutler Majestic Theatre (December 9-21). Around the corner at the Paramount Theatre, Black Nativity opens December 2 and tells the story of Nativity through scripture and the sublime poetry of Langston Hughes. The Hub holiday experience really is a theatrical and musical extravaganza. Maestro Keith Lockhart leads the Holiday Pops through yuletide hits all December long, and if you can’t get into a performance at Symphony Hall simply stroll down to Faneuil Hall and watch as a half-million LED lights pulsate throughout the historic marketplace to the tunes of the Holiday Pops. And for some beautiful baroque music head to Jordan Hall on December 15 or 18 for A Bach Christmas with Handel & Haydn Society. Families will find an array of fun and festive opportunities around Boston and also just outside the city. ZooLights at the Stone Zoo creates an enchanting winter wonderland, while down the road at the Concord Museum the exhibition Family Trees: A Celebration of Children’s Literature features 30 holiday trees adorned with ornaments depicting favorite characters and scenes from beloved children’s books. More fanciful trees are on view in Wellesley thanks to the Massachusetts Horticultural Society’s Festival of Trees and Snow Village, a magical display with model trains meandering through snowy villages and decorated evergreens. Take a short ride out to Carver for a wonderful New England tradition, The Christmas Festival of Lights at Edaville, and let the kids gaze in wonderment at the 17 million lights illuminating the park. Meanwhile, right in Boston’s backyard Sparklefest sets Harvard Square aglow with holiday lights and also includes visits from Santa, great shopping deals, and Christmas concerts. The fun doesn’t stop on December 26. In fact, Boston gears up for the nation’s oldest First Night celebration with First Night/First Day happening on Boston Common and Copley Square with a procession, ice sculptures, free entertainment, and, of course, fireworks! So come to Boston and enjoy this annual treat. The lineup of holiday programs and performances is beyond impressive, it’s incomparable and it’s happening here, the Hub of the holiday universe.